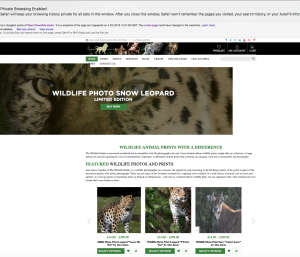 This is what happened last week when a new ‘client’ – Alex Jones, a ‘wildlife photographer’ who allegedly sells his own photos on his site, The Wildlife Studio (now posing as ‘Our Wildlife Studio‘ under a new URL and with another site at Photographic Safaris) – tried to scam me. Please read my tips at the end and share this post to help prevent freelancers from becoming victims. As ever, if something is too good to be true, it really is too good to be true. I ask a few questions. He needs his site to be optimised. I’m put in touch with his SEO guy. That’s only two days away and (despite the grammar) it’s fine, though I know I won’t send all the copy until receiving payment. We arrange a call so that I can get the info I need. He reminds me of Dr Doolittle – he tells me how he talks to the wild animals he photographs and talks about his pet parrot. He reveals he has a wealthy client who recently gave him a big commision. I look at the client’s Facebook page – lots and lots of angry comments from photographers plus reviews from freelancers complaining that he’s using platforms like People Per Hour and Freelancer to rope people in; that payment has not been made; and that he asks you to invest in a scheme to gain 200% returns in just a few days. So I decide to see how everything plays out … I tell him I need to receive payment before I can send more copy. He asks me to send my invoice. Now, in our call, he’d mentioned he lived in Greenwich – the address he gave on my terms is different (it’s the one listed on his website). He says it’s the studio and sends me an address in SE18. In my blog The Secret To Getting Clients To Pay On Time (And What To Do If They Don’t), I discuss why it’s important to check out if a company is registered or if the client may seem to be a company but is actually a sole trader. Why? If they’re a sole trader, you need their residential address as per the electoral register. Otherwise, if they end up being a dodgy payer, it’s tricky to take them to the Small Claims Court. You can fully check a residential address by paying £35.94 on 192.com to search the electoral roll. You can also confirm someone’s identity with Hooyu. Confirming the validity of a company is free and easy on Companies House. Your local council/library and the British Library hold copies of the electoral register that anyone may look at under supervision. Credit reference agencies can also buy the register to run checks. I hadn’t checked initially. But I did then. And I couldn’t find him. Oh, hello – is that my copy I can spy live on the website? Yes. Oh, and have I been paid for it? No. He sends me a jpeg showing his address on part of a council statement and on a poll card from May. (Who keeps a poll card for 5 months??) And here’s the thing – the personalised bits are in Gill; the rest is Helvetica. Hmmmm, the font on all poll card wording is always Helvetica. 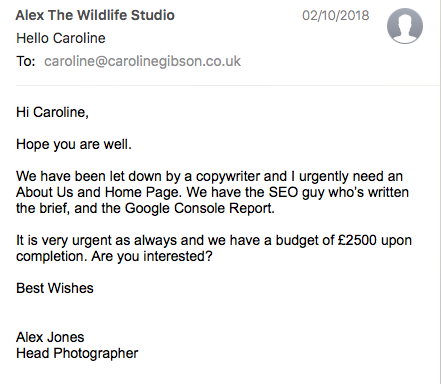 I’d cc’d the SEO guy when I’d asked for my copy to be removed, replying to an earlier email with the Maldives subject header to see if it raised a warning signal. He contacts me saying he’d also been offered this “opportunity”. Just like me. Plus, an investment opportunity returning a 200% profit in 4 to 5 days. Just like one of the freelancers who’d posted on Facebook. Whether the address is true or false, I do not want to reveal any personal info such as bank details in an invoice or, frankly, to have any further dealings with him. I receive another email suggesting that things are finalised today because he’s going to Kenya. OK, no more time wasting. I call Action Fraud to file a report. They act on behalf of the police, passing the case on to the National Fraud Intelligence Bureau. They advise me not to supply any details in case he re-uses them. They also recommend that Paypal and an email address are more secure for payment because your bank details are kept private. They give me a case reference number. They tell me not to have any further contact with him. I also report the matter to Google. Dr Doolittle? No. Dr Donogood? Oh, yes. BTW, here’s a Google cache of the home page before my copy, then with my copy. 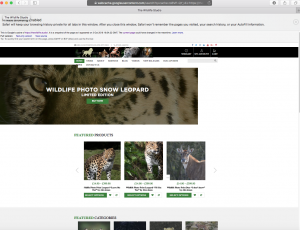 Quick update … a week after complaining to Google, they informed me that, in accordance with the Digital Millennium Copyright Act, the URL – https://thewildlife.studio/ – would be removed from their search results. What data is available for the website registration on Whois.net and how long the site has been registered? Does anything else raise a red flag if you run a search online? Has a client overpaid, saying they accidentally sent more money than they meant or that they’ve decided to cancel part of a project.? They may ask you to return the money by a different method. You may then find out their initial ‘payment’ to you was rejected by your bank or didn’t ever happen. Be wary of forged bank statements and convincing looking emails linking to a fake site and asking you for login details. If you receive money via PayPal, don’t click the link sent – go to your account via https://www.paypal.com/uk/home and make sure the funds have been received. A final tip: monitor your credit report on Experian in case someone has got hold of your details and is claiming to be you. If you’ve experienced something similar with ‘wildlife photographer’ Alex Jones of The Wildlife Studio (who has now set up another site offering photographic safaris, digital photography courses and private guided safaris in Africa), please email me so that incidents can be cross-referenced and the Action Fraud bureau can build up their case with concerns on several levels: for freelancers, for photographers, and for people buying the photos. 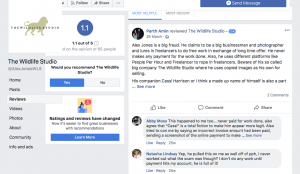 This entry was posted in Copywriting tips, Life as a freelancer, Marketing & branding advice and tagged Action Fraud, Alex Jones, Digital Millennium Copyright Act, freelance copywriting scam, Google, Photographic Safaris, The Wildlife Studio on October 6, 2018 by Caroline Gibson.